The variety of grain free foods for pets continues to grow, adding to what is already a very diverse food category. Beyond their unifying factor of being grain free, there is a wide variety grain free food for pet parents to choose from. When it comes to helping pets, it is the wide range of options which gives grain free foods their greatest advantage. Originally, grain free foods were formulated to try and mimic the nutrition found in a raw food diet. Grain free foods were the closest you could get to feeding your dog or cat a raw food diet, without actually having to feed them raw. Similar to raw foods, some grain free foods contain a high level of meat protein. Not surprisingly, the easiest way to see if your grain free food is similar to a raw diet it to compare the level of guaranteed protein. You know your dog kibble is in this segment if your protein guarantee is in the high thirties (or higher), and 40% or higher for cat kibble. Another big indicator is if meat ingredients dominate the top of the ingredient list. Even though this segment of grain free food has a higher protein level than most other dry foods, if compared on a dry matter basis, the level of protein is similar to a good quality wet food, and less than most raw foods. So we are not venturing into a new world of a high protein diet. In fact, it is not the level of protein that makes these foods different than other dry foods. Nutritionally, their uniqueness is their lower carbohydrate level. All foods only have three energy sources; carbohydrates, fats, and proteins. As the protein level increases the fat level usually also increases, by default the level of carbohydrate gets lower. This segment of high protein, grain free foods has approximately one half the level of carbohydrate compared to most other foods. A lower carbohydrate level has two advantages. The most obvious one is for a diabetic dog or cat. A non-overweight diabetic dog or cat can benefit by being fed a lower carbohydrate diet. 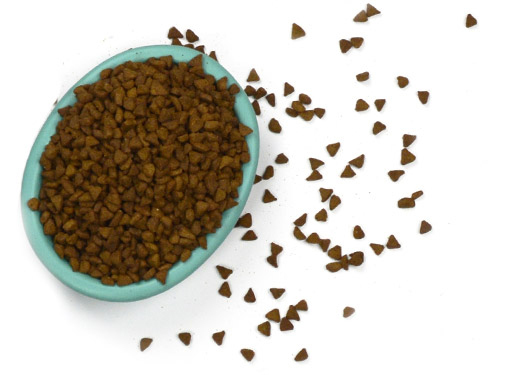 Often this segment of grain free foods can meet the lower carbohydrate requirement of a diabetic pet. The one nutritional factor missing for a diabetic pet is fiber. Supplementing with 1 tablespoon of canned pumpkin per ½ cup fed will increase the fiber content to a beneficial level. In their evolution, the natural diet of a dog and a cat was low in carbohydrate, and this may explain why a low carbohydrate diet can also help control appetite in approximately 15% of dogs and about 30% of cats. Having better control of their appetite explains why some cats can lose weight when fed a high protein grain free food that is also higher in fat and calories. This section of grain free foods is still the most different from other natural foods, and therefore has the greatest chance of helping some pets. Trying to segment the different grain foods is tricky, because there are just as many grain free foods that fall between the different segments that we are talking about here. Another segment of grain free food that is definitely worth mentioning are foods that are sometimes referred to as ancestral foods or regional foods. The concept being that before pets were domesticated, the natural diet of a dog or cat would have varied depending on the area or region in which they lived. Within a brand that carries these types of diets, there are typically multiple recipes and each recipe has different combinations of meat ingredients along with a variety of different fruits, vegetables and carbohydrate sources. Depending on the brand the protein level varies, but usually it is in the mid-range; 27-33% for dogs and 33-36% for cats. Because of their slightly higher protein level, most of these foods are all life stage foods. If you think about it, a dog or cat in the wild also did not change their diet as they went from youngsters to adults. Having a diverse list of ingredients within a food makes for a very holistic approach to nutrition. Having a variety of different meat blends also allows you to find a food that best suits your pet. Although not new to the grain free family, limited ingredient foods continue to expand in their diversity of brands and unique meat proteins. Instead of having a wide variety of ingredients like most other grain free foods, the goal of these foods is to have the fewest number of ingredients to help pets with food allergies or food sensitivities. I remember when Lamb & Rice was practically the only hypoallergenic food available. Now you can find a very wide range of different meat proteins in limited ingredient foods. The expansion of this segment is great news for pet parents who exclusively feed a Limited Ingredient Diet to their pets, as it is now much easier to find a food that suits your pet. The latest additions to grain free foods are he life stage and specific purpose foods. This is sort like going full circle. Originally, most of the grain free foods were all life stage diets because of their higher meat protein content. Now there are some grain free foods, are formulated for a specific purpose or life stage, such as puppy, adult or large breed dogs. This is similar to how other natural and super-premium foods are formulated. If your dog or cat has a specific need, these grain free foods may be more suitable for them. As the diversity of grain free foods continues to grow it is not surprising that pet parents are finding a greater number of dogs and cats are able to find a food that better suits the nutritional needs of their pet.